Ohhh Lulu...: My first show! Yesterday, I did my first show! 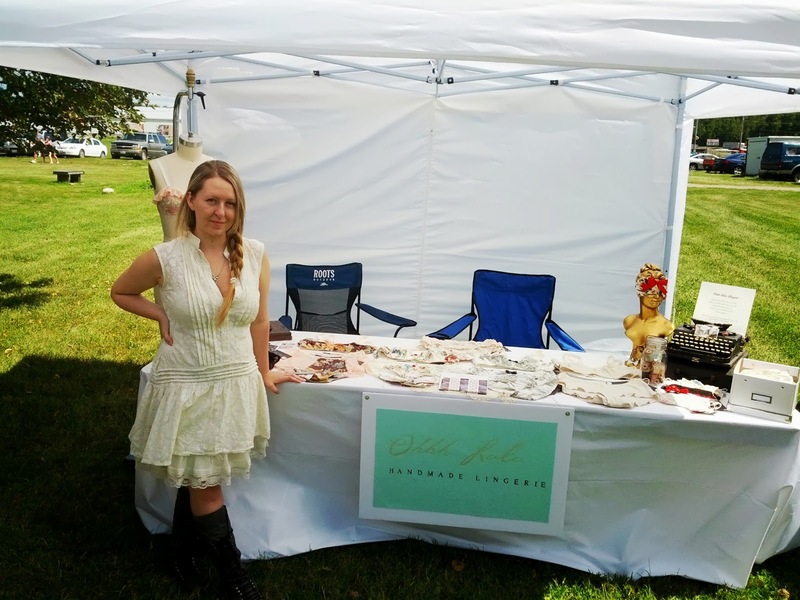 I was at the Coldwater Steampunk Festival. I had no idea what to expect, but it ended up being a lot of fun! I'm already excited about next year. I had never done anything like this before, so I really wasn't sure how much to prepare, or what I would need. Considering Dan and I pulled many of these things together late Friday night, we put together a pretty good booth. I have lots of ideas for next time... and am dreaming of having a booth at some bigger events in Orillia next summer (time permitting!). Imagine getting your hair permed with this contraption? What a gorgeous booth and your new collection looks as dreamy as always! What a lovely booth you guys put together. Those beautiful vintage props are definitely very 'Ohhh Lulu' and go very well with the gorgeous lingerie. I love your dress! How fun! I hope you guys had a great day! Your setup looks great, wonderful props and what looks like a fun atmosphere! Also, watching LARPers is the best people watching opportunity one could ask for. Love it.